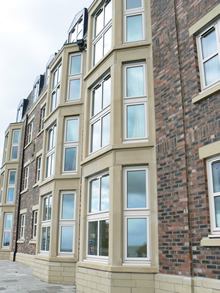 When Charles Church wanted to develop a new apartment scheme in a coastal location steeped in history, they turned to H Jarvis Ltd for windows and French doors that were practical yet aesthetically pleasing. 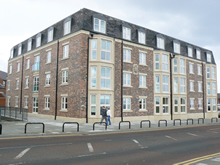 The impressive Winslow Court development of two bedroom apartments at up and coming Cullercoats in North Tyneside was built on the site of the former Bay Hotel. This very popular hotel and restaurant, which was built in 1870, occupied an imposing position overlooking the bay and harbour with magnificent sea views. Cullercoats was the home of the famous 19th century American watercolour artist Homer Winslow, from whom the development gets its name. The £6.5 million development of 31 apartments is a landmark scheme for the area and utilised a variety of building materials to satisfy the restrictions imposed by local planners. This included a timber frame structure, with a brick and art stone facade. Using the Sheerframe 6000 system H Jarvis supplied fully reversible windows and French doors with cream foils to complement the building’s external finishes. An internal courtyard featured white windows. The position of Winslow Court bounded on three sides by residential dwellings with a busy road to the remaining boundary required careful site management, which was aided by H Jarvis’s ability to manufacture and deliver windows and doors in line with the build programme.